"It's certainly a phenomenon in all walks of life. At one point you've got it, then you lose it. And it's gone forever…"
The premise of Sick Boy's all-pervasive theory rang in my ears as I watched the original T2 movie. 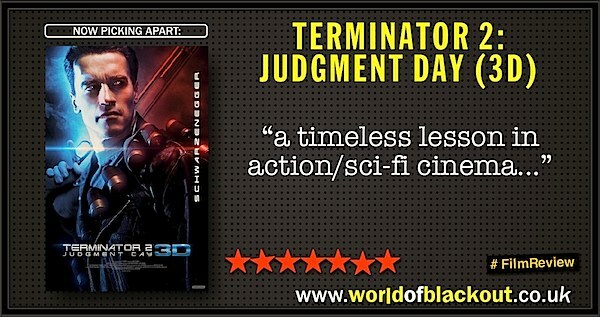 As a combination of nostalgia and enduring awe swirled around my mind on the 20th anniversary of the film's Judgment Day, it did not escape my attention that there is something to be learned here. No matter how interesting or well-intentioned the subsequent Terminator sequels (and TV spinoff) may have been, they have never recaptured the greatness displayed in the first two installments*1. Much like the first Terminator movie, I always seem to forget how utterly fantastic the sequel is until I'm watching it. James Cameron's 'reveal' of Arnie's character-role is nothing short of masterful and gets better with each viewing, with the absolute buy-in of the entire cast (plus we effectively get it twice - once with John's discovery and again with Sarah's). Many hold up Linda Hamilton's performance as Sarah Connor as the pinnacle of Strong Female Character™ portrayal*2, but there's really so much more here. Afraid, unsure, neurotic, cruel and blisteringly angry. Hamilton is the prime example of why we need interesting characters, not strong ones. Edward Furlong's overacting hasn't aged particularly well, but you can't have everything. The stereoscopic conversion of the film (the real reason for the screening, rather than the fictional anniversary of something which we've never seen actually occur) is beautifully executed, and the occasional glance-over-the-glasses reveals its constant use in this remastered version. Unfortunately, cinematographer Adam Greenberg didn't orchestrate his work to be watched in three dimensions, so other than background-depth it really adds very little. 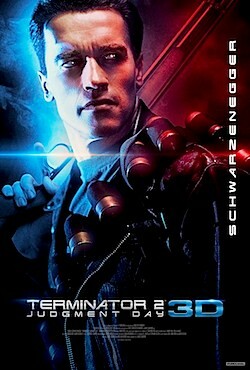 In fact, Terminator 2 is so visually engaging anyway that it's barely noticeable. The 3D certainly doesn't get in the way, at any rate, and if the end result is the crystal-clear print we now have, that's absolutely fine. Random thought during the film: I like that they hired Don and Dan Stanton to play the hospital security guard for the scene by the coffee machine. As if the folks at ILM were like "Yeah, I know you want the guy to be looking at his robot double. But trust me, blue-screening it will look like Captain Mainwaring's brother in Dad's Army and we're too busy in here making the Silver Surfer Terminator. Why can't you just hire twins, or something..?" One question, though: Why does the T101's internal readout have a decimal point for the number of human casualties? What constitutes a fraction of a death in the Terminator's eyes? If you get the opportunity, hell yeah. 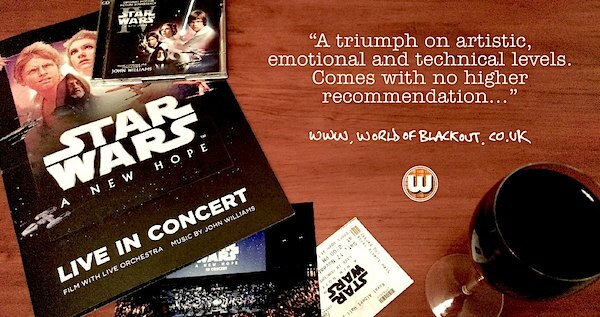 Several cinemas have it playing through the week and into this weekend. Level 2: Although by all rights I should really credit ILM's Dennis Muren and veteran stunt-performer Vic Armstrong as a level-1s, this film stars Linda Hamilton who was in 1984's The Stone Boy alongside Wilford 'Noa' Brimley.